Comic Book Movie is an action game on www.bestgames.pk. In this game, your objective is to control the hero to arrive at his destination. Move the mouse on the screen to guide the movement. Press keys 1 to 4 to shift among different weapons and press the space bar to use the special skill. Avoid touching your enemies and collect coins and other bonus items. You can upgrade yourself after each level. Good luck! Have you seen the new movie about Cinderella? If you have you must have appreciated how much work has been done on the costumes. In this game you can try on all the best costumes from the movie! Every Friday night Elsa, Rapunzel and Ariel like to get together and go out. The girls decided to go to the cinema this evening and they need to get ready. This time they won't have just a regular girl's night. 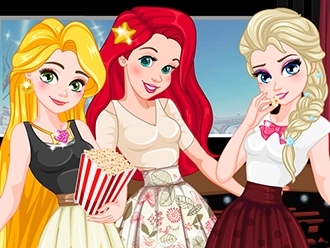 Their crushes are also going to the cinema to watch the same movie so it's the perfect time for the princesses to spend their evening in the company of their crush. This means that the girls want to look fabulous so you must help them pick the perfect outfit. Enjoy! Play free game Los Angeles Movie Star Prep on bestgames.pk. Every fashion girl loves fashionable dress-up. As a skill game on www.bestgames.pk, Los Angeles Movie Star Prep delights you with the opportunity of dressing up different models from face cleaning and preliminary make-up to hair styles, lipsticks, mascara creams, and etc. Particularly, only by completely finishing the face cleaning can you continue the next step. Come on! Train yourself to be a trendy and charming girl!